Having lived in Sunnyvale and Millbrae, the Filoli garden in Woodside has always been a local SF attraction I wanted to visit. I have heard of the location both online and from colleagues at work. Similar to other botanical gardens, Filoli is no different, except that is resides on an old estate and a historic preservation. Filoli was built for Mr. and Mrs. Bourne, who were the owners of Spring Valley Water Company and provided water to the region. Filoli is the first two letters of "Fight, Love, Live", a common phrase Mr Bourne said. The entire Filoli property is a whopping 654 acre lot. The mansion at Filoli, built in 1915-116, is 36,000 sq ft with 43 rooms and 17 bathrooms. The tour available to general admission is most of the first floor, and the rooms are just amazing. There are guided tours that wind through various rooms, explaining much of architectural and historical details that are not obvious at first glance. The house is surprising well maintained and I learned more than expected. Most interesting to me were safes located behind hidden walls throughout the wall to safeguard the Bourne's wealth. Some of them were later converted to wine cellars in safes. The upper floor of the mansion is reserved for "Friends of Filoli" and staff. After touring the mansion, we began our walk through the 16 acres of garden. This was similar to many botanical gardens. Tons and tons of flowers. Additionally, there are fruit trees like apples and pears, though it is important not to pick it. Be sure to walk through one of the small buildings located in the garden. It's full of fragrant flowers, which was my highlight of the garden. Near the back is a large paved spaces that was a converted tennis court to modern day event area. There are several fountains dotted throughout the garden along with an actual pool in the backyard. 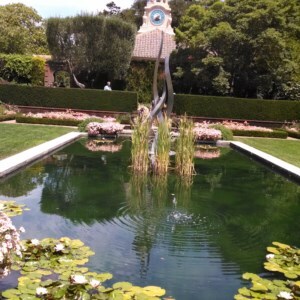 Filoli garden is a great place to get away. It's located in a fairly remote area of Woodside. The place was much more crowded than I was expecting. There were many families, a few tourists, many retired seniors, and several groups of couples just enjoying the day. For me, visiting Filoli is a one time thing. I don't expect much to change if I were to visit again. However, we did take a look a year memberships, since it is a great place to sit on a bench and enjoy the afternoon. Do not that despite it being a garden, no food or drinks (except water) are allowed to be brought onto the property. I visiting on a warm Sunday afternoon in late July 2014. I ended up going with my wife and my parents, which worked out perfectly. Cost of admission if you pay in Filoli is ~$20 per person, but I easily found Groupon selling discount tickets for 50% off. We ended our 2-3 hour day in the gift shop where they sell small snacks, Filoli branded merchandise, and plants. Read about more details at http://www.filoli.org/.